The Blue Leg Hermit Crab, (Clibanarius tricolor) is good at removing hair algae and detritus, and fair at removing some kinds of cyanobacteria and film algae from your tank. They will spend their time on the rocks and on the substrate of your aquarium, with a preference for the rocks. They are safe to add to most macroalgae planted tanks, but will consume some fleshy algae like scroll algae, halymenia, and ulva. The Blue Leg Hermit Crab can grow large enough to inhabit a one and a half inch shell, and does well in groups. 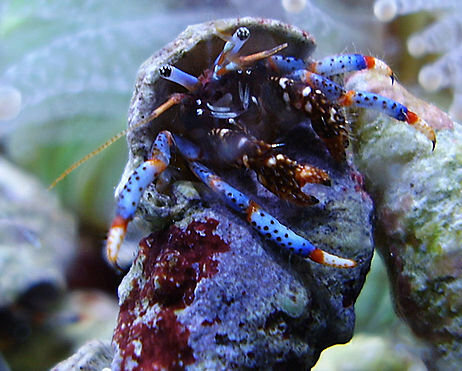 While they are considered reef safe, they may attack snails for their shells, having extra empty hermit shells available for them can reduce this behavior. You can have a cleanup crew that will get the job done without hermits, but most people enjoy their comical antics as they scurry about the tank. We cover a maximum of 25 Blue Leg Hermit Crabs sent via Priority Mail.